Guysssssss. Who knew vegan desserts could be SO delicious? This is another recipe from my friend Daniela over at //dulce y natural// blog. The //original recipe// was for chocolate chip cookies, but for whatever reason, the dough did not really come together enough for me to be able to roll into a ball, so I improvised and pressed it into a pan to make chocolate chip cookie bars instead. I suspect my issue may have been that my house was so warm to start, that my coconut oil was already in the liquid state. In her blog Daniela instructs you to work quickly with your hands in the dough, as the heat from your hands will keep the coconut oil soft. Maybe when she made them, the coconut oil started to firm up just enough to tighten up the dough. But not for me on a 90-degree day here in the Pennsylvania countryside! Regardless, these chocolate chip cookie bars were a major success. I baked them for the same amount of time, maybe a minute or two longer, than the cookie recipe, and they made my house smell amazing! I lined an 8×8 pan with parchment paper, and when the cookie bars were done baking and had cooled a bit, I lifted them out of the pan and cut them into bars with a chef’s knife. The day I made them, I was meeting my mostly-vegan BFF for dinner and decided to bring a box for her and her wife to share. The next day she texted me and said they couldn’t stop eating them and they wanted the recipe! These chocolate chip cookie bars were made from ingredients I already had in my house, which was also awesome, because I didn’t have to go buy anything fancy to make them – and, also, because that means I can basically make them anytime I want! 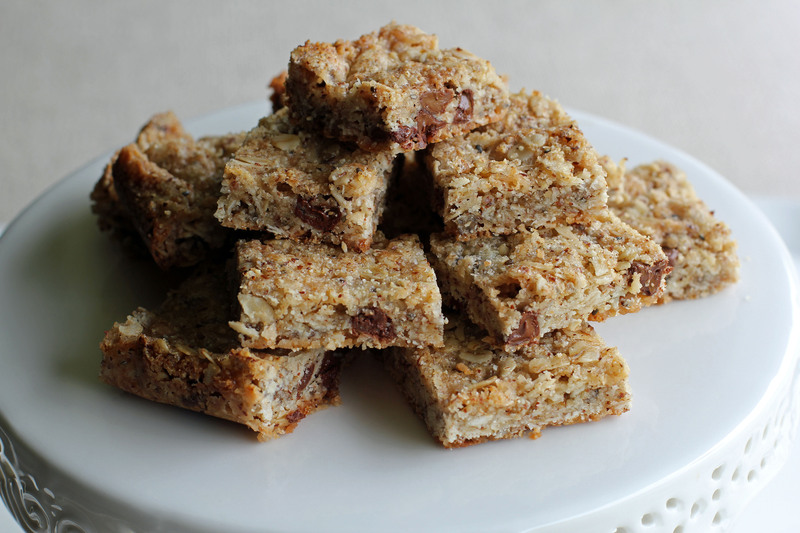 I hope you head on over to Daniela’s blog and give these chocolate chip cookies (or cookie bars!) a try. And while you’re there check out the rest of the recipes… I’ve got my eye on that carrot cake next! !